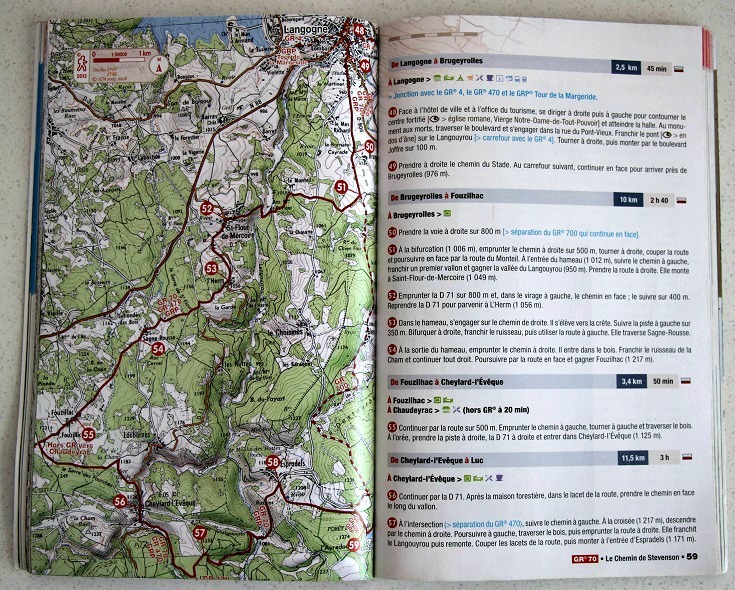 If you’ve read the previous section on Planning an itinerary, you’ll know that my preferred guidebook for long-distance walking in France is the TopoGuide. But there are several other options and another popular choice among walkers I met was the Miam Miam Dodo guidebook. Of course, we all look for different things in a guidebook and what appeals to me may not suit your needs at all. The most important thing for me is the topographic map and I will always buy a TopoGuide if one has been written for the walk I want to do. Many people start a walk with a schedule and a list of villages they plan to stay at along the way but prefer not to book accommodation too far in advance—remaining flexible in case of bad weather, injury or needing (or not needing) a rest day. 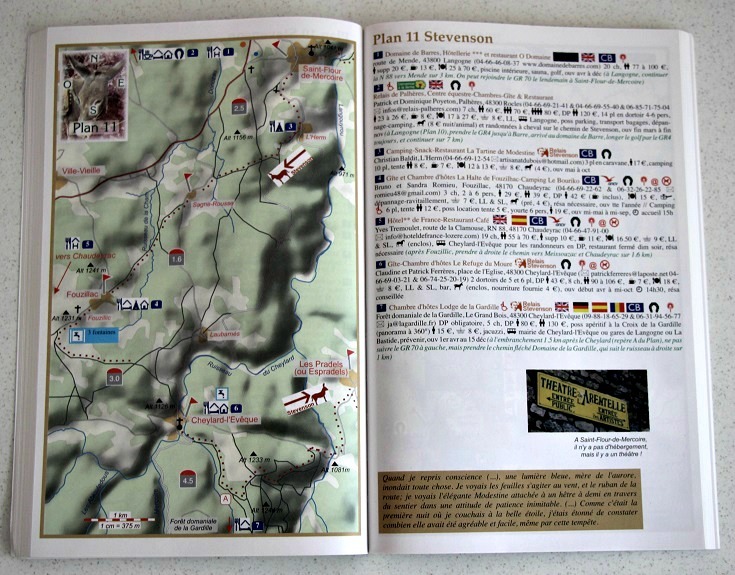 If this sounds like you, the layout of the Miam Miam Dodo guidebook with maps and accommodation listings on facing pages will suit you much better. To get a better feel for the differences between the TopoGuide and the Miam Miam Dodo guidebook, I carried both as I walked the GR 70 Chemin de Stevenson and the comparison below is based on these books. Some inclusions, such as where to rent a donkey, will not be applicable to their guidebooks covering other walks. Topographic maps which show the GR path, roads, all towns and villages and other useful landmarks. Walking notes which include the distances and time to walk (based on 4 kilometres per hour) between villages and a description of the terrain. The story of Robert Louis Stevenson’s walk from le Monastier-sur-Gazeille to Saint-Jean-du-Gard in 1878 on which the GR 70 is based. Descriptive sections elaborating on the landscape and history of the landmarks and villages along the path. What I like about the TopoGuide? I’m a big fan of topographic maps—they give a good sense of the terrain as well as showing roads and villages. I can see at a glance whether the path is hilly (and how steep the hills are) and where a nearby road might avoid a hill or a muddy section of track in the rain. I can see how many hamlets, villages and towns we’ll pass through, how big they are and, therefore, how likely it will be that we’ll find water or a café. I would find it difficult to plan a walk without a topographic map. The walking notes confirm (or correct) my interpretation of the map. Although I don’t usually read them as I walk (GR paths are generally well marked and easy to follow), I do check them each morning and use them to get my bearings throughout the day. What I don’t like about the TopoGuide? The absence of an address on many of the accommodation listings makes it difficult to guess the location and assess their suitability. If you are booking accommodation a day or two in advance as you walk, then a name and telephone number (and an assumption it will be close to the path or you will be given directions when you book) may be all you need. Accommodation with telephone numbers, addresses and websites if applicable. Supermarkets, restaurants, pharmacies, Tourist Offices and ATMs (not all ATMs accept foreign cards). What I like about the Miam Miam Dodo guidebook? Knowing which villages had a water fountain was a big plus on days when the temperature was over 30 degrees Celsius and we passed few cafés. What I don’t like about the Miam Miam Dodo guidebook? Like the TopoGuide, it is written in French. And again, this is not a complaint as all the important information—town names, addresses, phone numbers, distances and times—are the same in any language. In this guide too, I tend to skip over the history and descriptive sections and if your knowledge of French is very limited, you may struggle to absorb all the information it contains. I don’t get any sense of the terrain from the maps. Very few sections are marked with the >>> arrows indicating hills, and without walking notes to describe the terrain, the maps give the impression that this walk is mostly flat. That is not the case. Why would you buy an I Love Walking in France guidebook? Obviously, I managed to walk the GR 70 Chemin de Stevenson without the benefit of owning one of my own guidebooks. But it required many days of researching and planning. The process I used is described here and you can follow these steps to plan any long-distance walk. If you’ve got better things to do (and because I wouldn’t miss an opportunity for a shameless plug), you’ll find everything you need to quickly and easily plan an itinerary, book accommodation—and much more—in an I Love Walking in France digital guidebook. Do you have a favourite guidebook—perhaps one not mentioned above—that you think other walkers would find useful? Please, leave a comment below and pass on your tips.